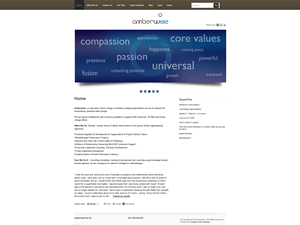 Amberwise help businesses develop, sustain vision & values driven teams in the pursuit of their organisational objectives. They are based in Australia, Asia and North America with resources supporting performance and change efforts across the UK, Continental Europe, the Middle East and Africa. They needed to update their website in a hurry. Amberwise had a basic website but it wasn’t going to deliver the punch they needed, to quote Joe Bradford ‘it’s state was embarrassing’. With new partners coming on board and high caliber clients interested in their services they had to move quickly, but get it right. Amberwise is also made of various principals who also needed to have their input into the design and functionality brief. Logistics was an issue as there were 3 different locations involved for these vested parties. The website was also lacking graphically and didn’t reflect the full nature of the business effectively. By using our fast track build brief system we were able to collate the majority of the information in a single 2.5 hour session. We ran a group coaching call so all the principals could have their input. At the end of this session all parties had a short action list making it very clear and concise what was needed to move the project forward in the short timeline set. Within 7 days the site ‘style guide’ was presented and signed off on along with all the graphical elements created. 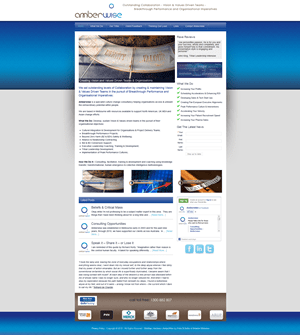 The site was then reloaded, with the new information architecture set up and new content added. The team at Amberwise first approached us on the 11th January, the contract was confirmed on the 14th and we went ‘Live’ on the 25th January. So 11 days including weekends so in fact 8 business days the site was rebuilt and had gone ‘Live’. Joe Bradford has endorsed your work as Head Honcho Smarter Websites | WordPress Website Design | Lead Generation | Social Media Marketing at Smarter Websites. Julie Smyth has endorsed your work as Head Honcho Smarter Websites | WordPress Website Design | Lead Generation | Social Media Marketing at Smarter Websites. I’m very happy with my website too! I’m finally able to showcase my work to the world. Same amount of time for my website and I can’t wait to see the results!